The head of the OECD said today that he regretted the rich nations club's failure to predict the crisis triggered by the collapse of Lehman Brothers a decade ago, saying economic forecasts needed to better reflect reality. "At the end of my first year in office, in June 2007, the OECD economic outlook stated 'the current economic situation is in many ways better than what we have experienced in years'," Angel Gurria said. He told a meeting in Paris on lessons from the financial crisis that reading these words today feels "like stabbing myself". "We were equally optimistic regarding the growing concern about the US mortgage industry," Gurria added. "When one is so happy to be professionally optimistic, then of course you disregard the voices that are warnings," he added. Lehman Brothers, a 150-year-old investment bank weighed down by risky debt holdings made up of subprime mortgages, collapsed in September 2008, prompting the worst global economic crisis since the 1930s. Gurria said the crisis had made clear that "mainstream economic thinking and the models it was based on did not reflect the reality either of the economy or people's life". "This is why we did not see it coming. We had it wrong and we will have to confess that," he said, in an unusually frank admission from someone who was a senior global financial figure at the time. 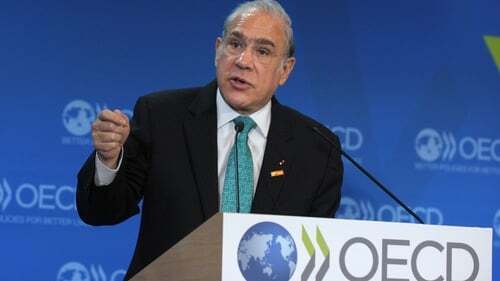 "We can begin by not turning a blind eye to the sentiments of the people we left behind, we must listen to what the people have to say," Gurria said at the OECD headquarters in Paris. The Organisation for Economic Co-operation and Development, founded in 1961 to boost global trade, now counts 36 member nations, most of them wealthy economies.